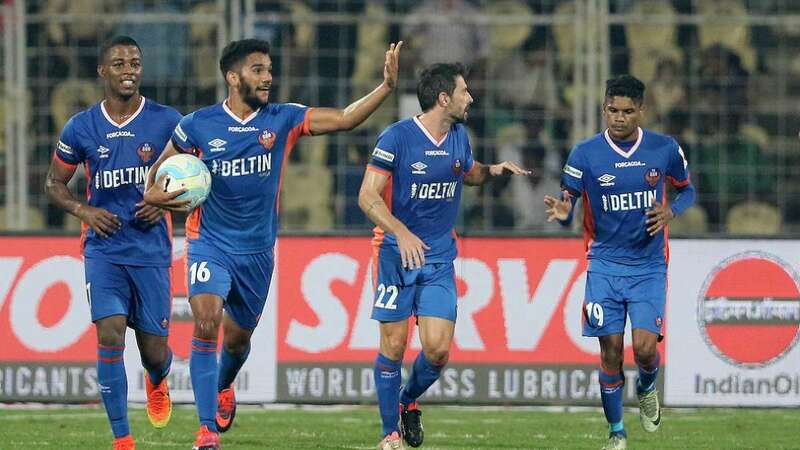 Goa : FC Goa broke their home duck against Chennaiyin FC in dramatic fashion after scripting a stunning 5-4 victory in their final Hero Indian Super League clash at Jawaharlal Nehru Stadium, Fatorda-Goa. Chennaiyin FC had won all three matches in Goa, including last season’s final that went down to the wire. The visitors took the lead three times in this game but found themselves down in the 76th minute for the first time when Rafael Coelho scored his second goal of the night. He seemed to do enough but Chennaiyin FC drew level in the 88th minute after substitute John Arne Riise converted a penalty. It seemed Goa would have to wait till next season to carve their first win at home over Chennaiyin FC until Sahil Tavora stunned everyone with the winner in added time. FC Goa scored through a brace each from Rafael Coelho (6th minute, 76th minute), Sahil Tavora (68th minute and 90th minute) and Joffre Gonzalez (21st minute). Chennaiyin FC found the mark through Jerry Lalrinzuala (4th minute), Gregory Arnolin (own goal, 14th minute), Dudu Omagbemi (28th minute) and John Arne Riise (88th minute). Chennaiyin FC led 3-2 at half-time. The victory took Goa’s points tally to 14 but they still finished at the bottom. Defending champions Chennaiyin FC finished seventh with 15 points in an extremely disappointing campaign for both last year’s finalists. Chennaiyin FC surged ahead in the fourth minute itself when Jerry scored from a free-kick to dazzle goalkeeper Laxmikant Kattimani but FC Goa soon equalised as Rafael Coelho got hold of a through ball from Joffre Gonalez and then scored with ease. Chennaiyin FC took the lead for the second time in the 14th minute when Anirudh Thapa’s shot that hit the post, struck Goa defender Gregory Arnolin and sailed into the net. Just like the first setback, Goa drew level for the second time, this time Joffre scoring from a penalty. The visitors enjoyed a 3-2 advantage at half-time as Dudu Omagbemi capitalised on a defensive lapse in the 28th minute.In the second session, Zico made a couple of changes and FC Goa not just equalized through Sahil Tavora but also moved up for the first time as Rafael Coelho gave finishing touches to a brilliant long ball from Trindade Goncalves in the 76th minute. The goal seemed enough for Goa to pocket full points as they fell back and defended but there was disappointment as Raju Gaikwad handled the ball, prompting the referee to award a penalty which Riise scored with ease. Just when it seemed like the match would end in a draw, Sahil Tavora scored a wonder goal from the left, as his shot kissed the post and sailed into the net for one of the ISL’s most dramatic victory.